Everyone who teaches moon phases, from K-16, has their own favourite approach and apparatus. We get 30-40 students for a 50-minute period in our lab, a time meant targeting concepts are better learned in a hands-on environment. Our activity is built around an remarkable, 10-second experience: Students hold a styrofoam ball at arm’s length in a darkened room with one, bright, central light source. They do a pirouette, watching the pattern of light and shadow on the “Moon”. Ooohs. Aaaahs. Lightbulbs going off. Truly a golden moment. This page contains materials for what we do for the other 49 minutes and 50 seconds of the lab. Each group of 3 students gets 2 styrofoam balls, one Earth and one Moon. 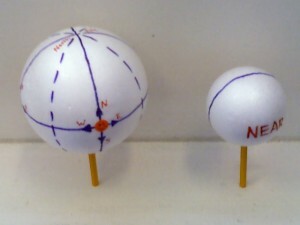 As the picture shows, we divide the Moon in half and write “NEAR” and “FAR” on the hemispheres. On the Earth ball, we draw the Equator, meridians at 0, 90, 180, 270 degrees longitude (which are 6 hours of daily rotation apart) and dashed meridians on the 45’s (3 hours of rotation apart.) A small sticker represents the observer and the cardinal points help students remember which way to spin the Earth to mimic the daily rotation. 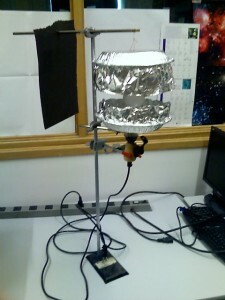 At the center of the lab sits “the Sun”. This is a really bright lightbulb (150 W or more) on an equipment stand. To prevent light from scattering off the floor and ceiling, we built aluminum foil “baffles” that sit above and below the light. They allow only thin disk of light to shine into the room. The light bulb is set to the students’ shoulder-level so when they hold the Moon at arm’s length, the styrofoam ball naturally goes into the light. After running this activity for several terms, we realized there is a lot for the teaching assistants to do and say to keep the activity running. Those instructions eventually found their way into this instructor’s guide, available on this password protected page. Send me a message newbury@phas.ubc.ca for a password. If you use the materials here and find a alternate approach, tweak or extension, please share it by leaving a comment. Thanks!